SPW019494 SCOTLAND (1927). 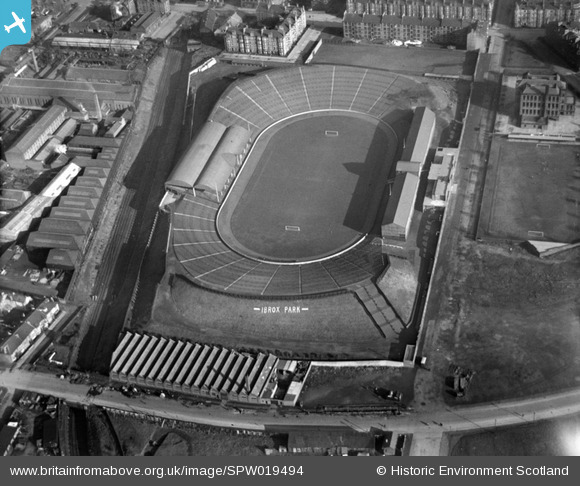 Ibrox Park, Glasgow Rangers Football Club, Edmiston Drive, Glasgow. An oblique aerial photograph taken facing east. Title [SPW019494] Ibrox Park, Glasgow Rangers Football Club, Edmiston Drive, Glasgow. An oblique aerial photograph taken facing east. The office and dressing room block (marked with a square) has just been completed before this photo was taken, replacing the old Pavilion which had stood since 1899 in the South East corner of the ground. Note the rubble from the recently demolished Pavilion (circled) in the image. 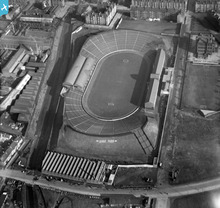 An aerial photograph from 1920 shows the Pavilion alongside the old South Stand without the offices and dressing room block. Ibrox Stadium. Home of Rangers Football Club. Ibrox. Previously home to Rangers Football Club. Now home to The Rangers, founded in 2012. There has never been a team called Glasgow Rangers. The Rangers Football Club play here and always will. What a shame to see what the club,Rangers, has become....not many clubs had ground,or attracted such huge crowds other than Celtic at this time. You should also view Love Street(St Mirren Park), St Mirren's old ground.